I guess I ran into the fence line here, so it's time to make other arrangements. It's inconvenient that this occurs as I'm trying to get a post up about this year's Ramble, but it's not like climbing those steep gravel pitches into a headwind with only one gear and dust in my eyes. Since last Saturday, I think some of you now have a fond appreciation for my refreshing prairie headwinds. I won't mislead you. I'm a little nervous about this year's event. Preparations have been a little more challenging this year. The unreliability of the Rosston General Store as a refreshment stop, and the infiltration of the oil and gas industry on some of our more "pristine" areas prompted a route change. I ended up with two alternate routes in hopes of minimizing a long headwind finish. Then I persuaded "GravelDoc" to make the trip down from Missouri to join the ride. Finally, if everyone that sent me a note actually comes, we will have our biggest Ramble ever. So, yes, I'm nervous. Expectations might be higher than ever. I hope my guests enjoy themselves. The current weather forecast for Saturday indicates cool temperatures, only a slight chance for rain, and WSW wind. If this holds, we'll take the Greenwood Loop route. That should make for a pleasant stop at the Greenwood Grocery and Grill. If the wind shifts to the north, we'll likely head for Gainesville. It's almost Saturday. 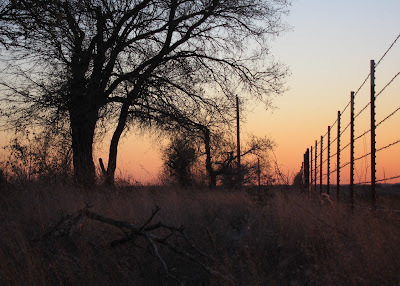 So pack those bags with snacks, cameras, and a relaxed perspective, come up to my little place on the north Texas prairie, and join your friends in a pleasant rural ramble. A little before sunset, I set out for a couple of hours. Sometimes I ride when I don't know what else to do. When life becomes difficult, I find that the rhythm of turning cranks and removing other sources of outside stimulus helps the meditation process. I have learned that pedaling can often be good medicine. I lost my father-in-law yesterday. His three children lost their father. His wife lost a husband, and many people lost a wonderful friend. I share in the collective grief, and I hurt for all of them. But in addition to that, I have my own sense of loss. I remember meeting him the first time my wife (before we were married) brought me home to meet her parents. I can only imagine what he must have thought of such an immature kid with his eldest daughter. But he always treated me like I was special. He was truly like a second dad for me. He was always patient, warm, hospitable, and in spite of my profound clumsiness, included me in his activities. I've spent many hours in his shop with him helping him build airplanes. It would have been more efficient for him to do things himself, but he took the time to teach me how to do things so I could be a part of his world. He made me feel like I was useful to him, and when we talked about more serious matters, he made me feel like I was making good decisions. Is there anything better for a man than this kind of affirmation? I can only hope he knows how much I appreciate the gift of his daughter, that I've done my best to take good care of her, and that I loved him dearly. So I rode tonight with my one gear a good deal of time into a 20+mph headwind. But when your heart hurts this much, you can't feel your legs. Because the Fourth Annual Fall Finale Forty-ish Mile Country Path Ramble is less than one month away! Since I normally ride alone, the possibility that others might come join me for my personal annual tradition makes me eagerly anticipate this ride each year. This year's Ramble will be on Saturday, December 15. We will roll out of my driveway at 10am. That means you should arrive in time to make all needed preparations before 10am. Speaking of weather, I always want folks to know that I'm not hard-core. I can ride if it is a little cold, or a little drizzly, but I don't like cold and wet. On days like that, I will send you on your way with a cue sheet and my best wishes, and then spend the rest of my day by the fireplace. The pace is what I call "conversational" because I think of this as a social kind of ride. We might stop for snacks, photographs, or just because. Like last year, I plan to have cue sheets available for those who might wish to ride faster or slower than me. The other thing to emphasize for this ride is that you are responsible for you. This is not a T-shirt ride, there are no entry fees, and no sag services. Both routes have at least one place to stop for restroom, water, or snacks. On one route that opportunity comes at approximately mile 19, and on the other route it comes at approximately mile 25. You should have a back-up plan for a mechanical problem, and beware...some areas on the Ramble route do not have cell phone service. Yes, it's rural. Plan ahead. If this Ramble thing sounds like a good time, block out the day and get it on your calendar now. Then make your contingency plan in case you can't finish the route for any reason. Finally, let me know you are coming. This seemed as good a place as any to pull my two chocolate-topped cake donuts from my gravel dust encrusted Carradice bag. I had stopped at the donut shop in Sanger and packed a little snack to compliment my thermos of coffee before making my way down to Elm Bottom Circle. The morning was cloudy and blustery. With the 20-30 mph winds and color frosted vegetation, the world seemed restless in anticipation of the season's next cold front. The colors mark a seasonal transition. I start a new job on Monday. Our Bible class begins a new study tomorrow. My daily routine will significantly change. But like always, my Saturday morning rides help me mentally process life's challenges. I am a huge fan of Frank Patterson's bicycling drawings. When I study them, I am inevitably drawn into the scene. I long to be there among those enjoying a bicycle outing in the countryside. Occasionally, I am fortunate enough to actually ride through areas that remind me of his scenes. So I smile because I realize that, for a few moments...and in a small way, I've become Frank Patterson's art come to life. 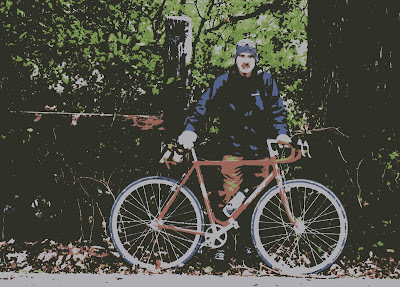 While playing around with Picasa's photo editing tools and a photo taken from today's Sunday afternoon ride, I accidentally stumbled on an effect that reminded me of Mr. Patterson's style. A computer doctored photograph is no substitute for a master's art. But it does provide me this opportunity to honor his work, and perhaps lead someone new to enjoy it. On the way to Culp Branch Native Prairie Recreational Area for a micro-tour. Goodies in the bag, and micro-blanket to keep things civilized strapped to the outside. The gate seems to encourage foot traffic, but not much else. 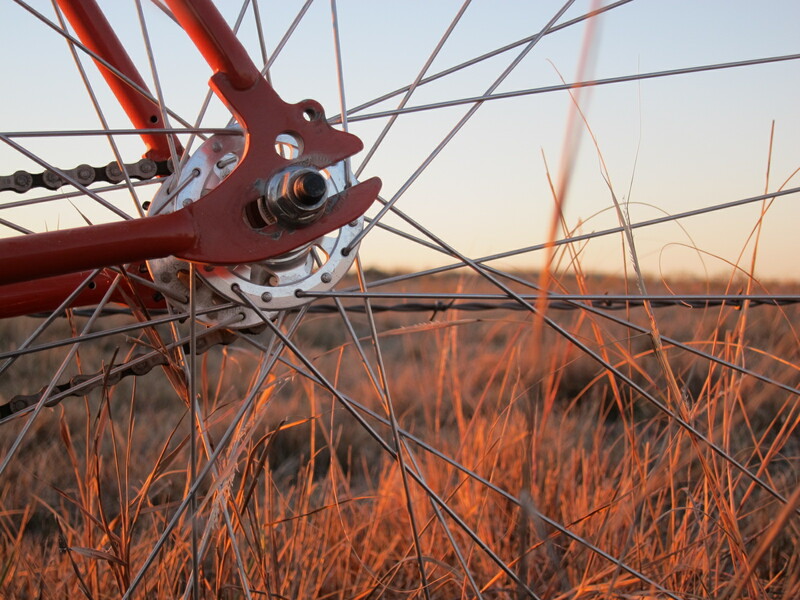 A bicycle oriented vertically on its rear wheel rolls through with no difficultly. At the start, there was a well-defined single track. It was smooth and pleasant to follow. In a short time, the trail became less obvious among the vegetation. As I was forced to watch the ground closer, and nearer my front wheel, I was reminded that this was once private property. Aerial photos show remnants of old home foundations, and a grid pattern to the trail system that was probably once roads. Patches of severely worn asphalt was observed on a few short sections of the single track I followed. My trail led to the lake, and lake access is one of the reasons I wanted to explore this area. Today the north wind blowing over the water made for a bit of a chill, so I retreated to a protected low area for my first coffee stop. There was evidence of abandoned homes for more than just people. As shown in the photo, this former bird's nest is only about saddle height on a 56cm frame. I'm guessing this home was built after the road became a footpath. Here's a quiet, wind-protected spot, to spread out the micro blanket and enjoy a couple of pop tarts and some hot coffee. It doesn't really look like a road in this photo, but there are visual clues in abundance of what once was. My blanket sits just on top of what appears to be a graded slope from natural ground level down to a lower roadway. The eager explorer waiting to get back on the road and head to the next destination. But not so fast. I've got a couple more sips left, and I am moving purposefully slow today. What single track through a north Texas native prairie looks like on a chilly, late October morning. I'll take this directly south to the highway, meander a few back roads, zip through Sanger, cross the Interstate, and arrive at my second coffee stop in about an hour. Duck Creek Road, on the south side of Sanger, is a low traffic road. There is a new bridge over Duck Creek, just west of the pecan orchard, with concrete side rails that include a nice flat sitting surface. Sitting and sipping, and watching the wind carry a few leaves away from their trees. Probably in the low 40s by now, and with the sunshine, time to shed a layer. Just ask me if this is better than 95 degrees. Duck Creek Road turns left just past the bridge here, and climbs a short steep wall. Then its just a few miles of low traffic county roads, and one more short patch of gravel before arriving home. Single track prairie souvenirs stuck in my drive train. Sometimes I think I should have named this blog "Bikes and Barbed Wire". It seems like 90% of my photos involve one of my bikes leaning against a barbed wire fence. I apologize to those who long ago grew bored with my primary subject matter. But until I get tired of it, I guess we're stuck with it. Perhaps there is more to be done with a bike and barbed wire, and I'm just the guy to figure it out. I've been seeing this guy a lot lately on one of my frequent routes. He's hard to miss. Maybe when I'm too feeble to ride a bike, I could get a fine, strong horse like this one to pull me in a wagon down gravel roads. Maybe I'd pose the wagon against barbed wire fences in four counties. In addition to bikes and barbed wire, I seem to have developed quite an appetite for fixed gear, mixed terrain metric centuries. I've got a nice, geared randonneur bike with plush 650b x 42mm tires, but I've been grabbing the Quickbeam lately. It's slower and harder, but I do it anyway. I've been pondering this, and have a few ideas. But, honestly, I can't explain it. Small gravel and early morning sunshine making thousands and thousands of tiny shadows that gives one of my favorite roads a visually interesting texture. Note how there is no barbed wire in this photo. We are beginning to see a few colorful signs of the autumn season in north Texas. We'll never have the gaudy, over-saturated red or yellow forest like other locales. Instead, we have a tree here and there with stand-out color. Even then, the bright colors are mixed in with a more tasteful balance of tree trunk for strength, and variations in color for a more interesting texture. We love our fall foliage just like the rest of you. There's probably barbed wire in this photo, but no bike. And sometimes you come around the corner to see the sunshine highlight a stark passed-from-this-life tree with no leaves at all. It has an interesting shape, and can still be admired. The gateway to Greenwood. Several photos have been posted of the outside of the Greenwood Grocery and Grill, but never the entry way into this lovely settlement. The Grocery and Grill is just around the corner in the shady spot. Note that the bike is leaning against a guard rail, and not a barbed wire fence. Across the street from the Grocery and Grill. Can you imagine a bunch of bikes parked here, leaning up against all kinds of things that are not barbed wire when this year's Ramble passes through here? And all the cyclists enjoying the camaraderie of pedaling rural roads. I can, and it looks delightful. North Texas is flat. But occasionally, I have to stand on the pedals, pull on the bars, and gasp for air. I don't know why. I must be old or something. Did you notice that this fence is not barbed wire? Yeah, a crazy experiment, and it caused me a little discomfort. I think it came out okay. This is the first place I can see the Wise County courthouse, sitting on top of the hill in Decatur, Texas. It's that little spike on the horizon in the opening between the trees (behind the barbed wire fence). In a little while, I can stop at the donut shop, buy a fresh sausage and cheese kolache (wikipedia says technically what I had was a klobasnek, most of us Texans aren't so technical), and look across the street at that same courthouse. Well because I know you've been missing the bike and barbed wire, I close with two classic Pondero photos. This one has some of that awesome, thousand shades of brown, shoulder high prairie grass blowing in the wind. And finally, just another bike, leaning against a barbed wire fence. Because, ...well...I guess that's just what I do.